and have a little nostalgic flip through as soon as Get It Scrapped asked for a page inspired by the use of textures in interior design. I had lots of tearsheets about texture in there: if you renovate a house to sell of course it pays to keep the decor neutral so that it appeals to as many potential buyers as you can find; and so the way to avoid bland and suggest comfort, cosiness and luxury is with texture. a tassel, some tied threads. But just look at those ears: don't they make you want to turn mouse for the day too? There's nothing about this page that isn't pleasing to the eye ... The witches! The wee houses! The glasses! Love, love, love! 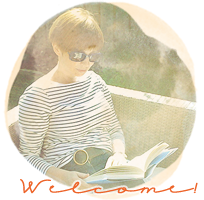 Fun page & I can only describe you as a brave role model of a scrapbooker. 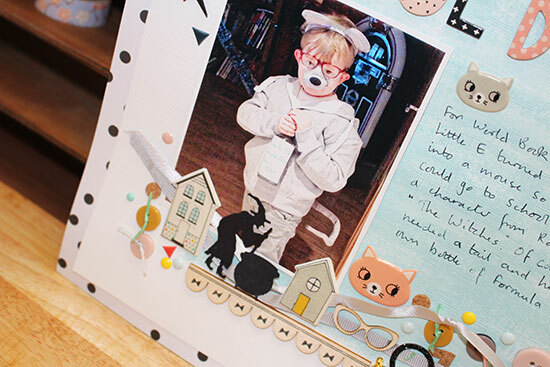 Of course the kitty head on the page drew my eye in but only after I had a good look at the photo of Little E as a mouse. Your ’bookshelf' works really nicely, with all those lively things to look at - not to mention Mouse Boy himself. I think the title is pretty neat too! Another incredibly complicated page, that looks so effortless in the end. Only those of us who fail utterly at embellishments can truly appreciate the magic you do! And Little E fits the role perfectly! Oh I would take him home he's darling! That photo is just perfect for this page! I love your strip of coolness and the mouse tails! So awesome! Your band of embellishments looks like an interesting gallery shelf. Love it. 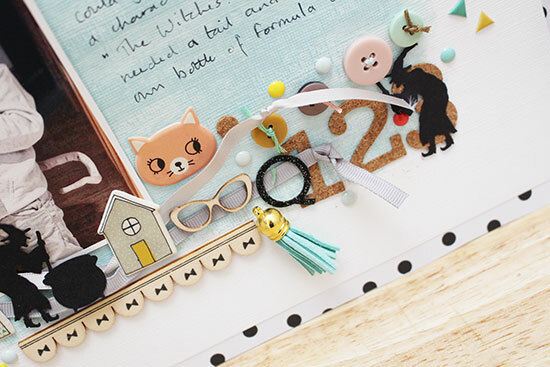 Sweet page - and I need to try that little band of embellishments idea too - been seeing it pop up more and more. And I have often wondered why you never show us a before and after of your renovation projects - we'd love to see. I'm going to have to try a shelf next time! I do love a good shelf for a page - that is a great collection of embellishments which all help to tell the story. What a great page! I love the accumulation of tiny decorative elements! What a FUN page to highlight that totally cute photo! I do like all those embellishments together in a line! 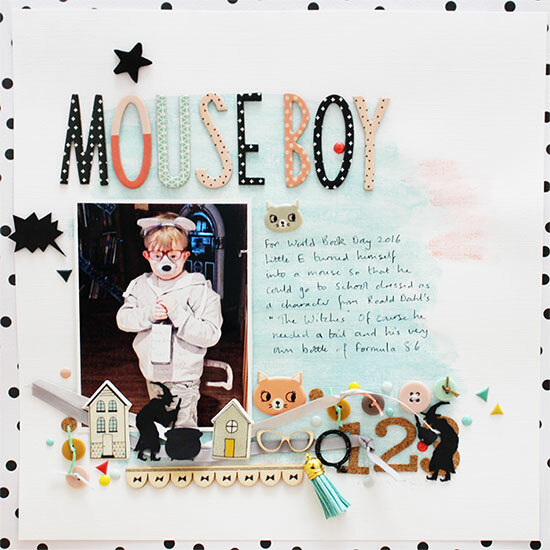 Little E looks great as a mouse and your page is just stunning!